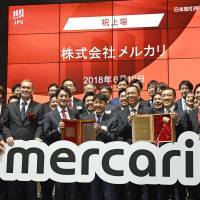 Mercari Inc., Japan’s first startup unicorn to go public, made its much-anticipated debut Tuesday on the Tokyo Stock Exchange’s Mothers section, becoming the largest initial public offering so far this year. Shares of the flea market app operator started their first day of trading at ¥5,000, up 67 percent from the initial offering price of ¥3,000. This put its market capitalization at more than ¥670 billion, making it the largest company on the Mothers market for startups, surpassing smartphone game-maker Mixi Inc.
“Through this IPO, we aim to push forward our effort to become a global-level tech company,” Shintaro Yamada, founder and CEO of Mercari, said at a news conference after the bell-ringing ceremony Tuesday. Mercari’s share price briefly surged as high as ¥6,000 in the afternoon before settling at ¥5,300, hitting its daily limit high in the process and valuing the company at more than ¥800 billion. It was the biggest IPO for a tech company since Line Corp. went public in July 2016. Mercari’s IPO raised more than ¥60 billion. “This is an unprecedented scale for the Mothers market,” said Hirozumi Kobayashi, an equity analyst at Fisco Ltd., referring to the amount of shares changing hands. Daiwa Securities Co., which helped underwrite the IPO, said only one in 35 investors who applied for shares was actually able to buy them. “Backed by the high demand, the market saw a strong initial price,” he said. The company’s flagship app, Mercari, is known as Japan’s leading online flea market platform, allowing people sell and buy secondhand items using their smartphones. The consumer-to-consumer marketplace became popular among users in Japan for a unique transaction system that, in cooperation with delivery firms Yamato Transport Co. and Japan Post Co., allows people to do business without telling other their names and addresses. From its launch in 2013 through the end of March, the app drew 71 million downloads in Japan, with more than ¥93 billion in transactions conducted in the January to March quarter alone, according to Mercari’s financial report. The app also has some presence outside Japan, with 37 million downloads in the United States, making it a rare example of a Japan-born startup succeeding in a competitive market. But the transaction volume in the U.S. has not yet matched the app’s popularity in its home market, with the total standing at ¥6 billion. “Starting from the U.S., we will boost our business expansion overseas so as to create a global-scale marketplace,” said Yamada, an entrepreneur whose previous firm, Unoh Inc., was bought by U.S. social game developer Zynga Inc. in 2010. Mercari has had units in the U.S. since 2014 and the U.K. since 2015. Overseas success will be a key indicator of Mercari’s future growth after the IPO, Kobayashi of Fisco said. 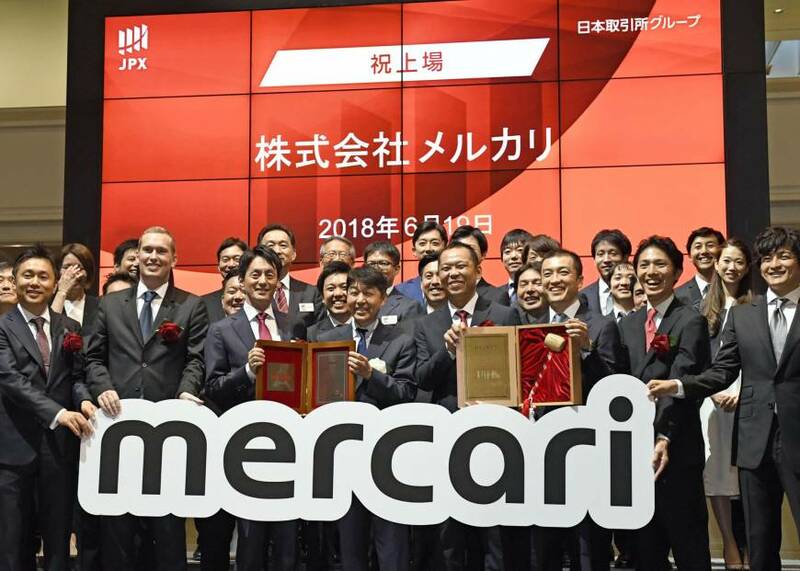 According to the financial report, Mercari recorded sales of ¥22 billion for the business year ended June 2017, up 80.1 percent from the previous year. But it recorded a ¥2.8 billion operating loss last year, largely due to increased advertising costs. Mercari is already profitable with its domestic flea market business, but it is still at the investment stage in other countries. Although Mercari may have achieved a high initial price, where it will go from there remains to be seen. This is because it is still hard to predict how much longer the investment phase will continue, said Kobayashi. Still, investors have high expectations for Mercari’s growth potential both in Japan and overseas, he added. When Line filed for its IPO in 2016, the battle for global market share among such messaging services as WhatsApp had been already been settled. But Mercari is still in the middle of its fight, so “compared to Line, I think it’s probably easier to imagine a growth scenario for Mercari,” Kobayashi said. As for the domestic market, the industry for flea market apps is rapidly expanding, according to a trade ministry report that says the size of the domestic market grew to ¥483.5 billion in 2017 after they began to emerge around 2012. One of the factors behind the rise is that people are more used to the concept of the “sharing economy,” in which consumers share goods and services, said Hiroyuki Nitto, senior consultant at Nomura Research Institute Ltd.
Nowadays, more consumers want to shop efficiently and recycle what they have, instead of just throwing items away. As a result, flea market apps that allow them to casually buy and sell via smartphones have been growing, Nitto said, adding that there appear to be many more people interested in the trend. Since its founding, the company has been one of the forerunners of the nation’s sharing-economy movement. Aside from its flea market operation, Mercari entered the bike-sharing business this year by starting an on-demand service called Merchari in February in Fukuoka Prefecture. It also established the financial unit Merpay in November with the aim of creating a new payment platform.